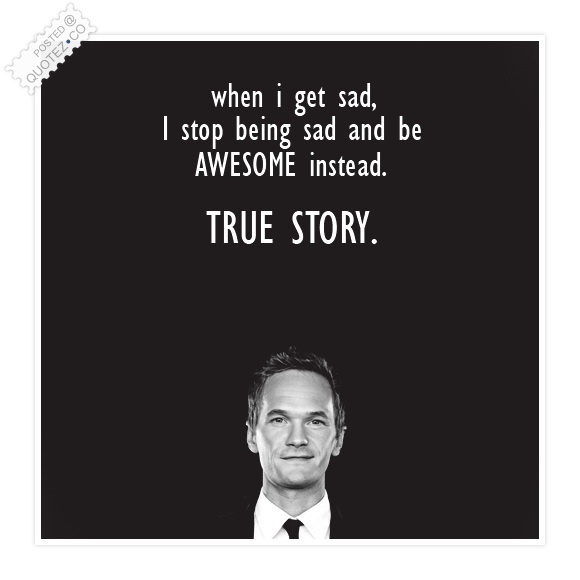 See the gallery for quotes by Neil Patrick Harris. You can to use those 7 images of quotes as a desktop wallpapers. I'm not the best cruise ship crooner. I'm not the best karaoke guy. I've been taking a trapeze class for the last couple of years. 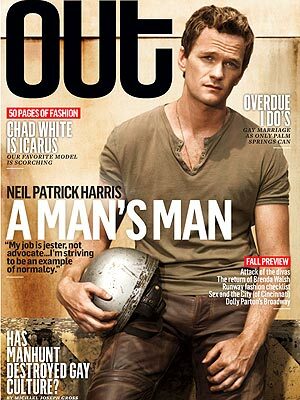 I'm working on my double back flip right now. Jim Henson was the only piece of fan mail I ever wrote when I was a little kid. Mr. Steven Bochco is a very wise man. After a many-monthed nationwide search to find a precocious teenage doctor, he hired me. What I enjoy so much about the Tonys' uniqueness is that anyone who's tuning in has an interest in seeing the show, so our job is halfway done. If I wrote a musical it wouldn't be about me. Although I do some magic, so it would probably be about a magician who appeared and re-appeared all over the place. A cardio-funk class - I should have at least taken one of those. But it's always terrified me. I'm never one to be a dancer on the dance floor, even at a bar or a club. Being able to live my life transparently does empower me to feel like I can be myself more. It's easier for me to flirt with girls now that girls know that I'm gay. It almost makes it a sexier encounter than if I was trying to pretend that I was straight. I always thought I'd make a good parent, but I was single and led a solitary life for many, many years. Then I met David, and he had experience with kids and wanted to have a family, too. I didn't want to go marching down the street with camera crews. Oy. To get married? Really? It seems like you have an agenda when you do it that way. I wouldn't want to get married to be an example. I don't know, on a sitcom, and in theatre especially, you have to really be listening to an audience. And if you're losing them, you can hear the sniffs, and the playbills shuffling and whatnot. 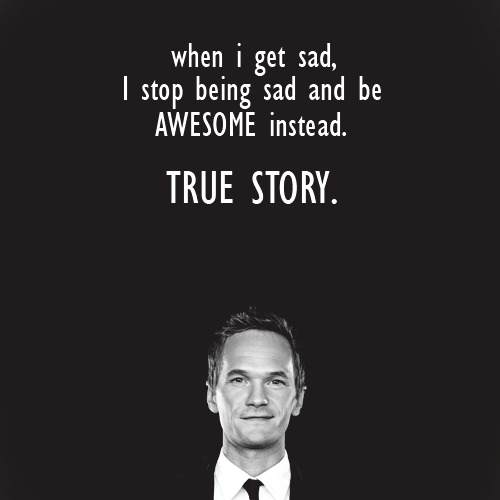 Much more quotes by Neil Patrick Harris below the page. I remember thinking that the rest of my life would be solo. I wasn't weepy when I thought that - it was just a realization that I had gone this long being self-sufficient. I think it has been a weird mistake to have people with their own music careers going on and judging people because when they're too critical, it affects them. They don't want to be that honest, because they need to keep their appearance up. I thought the idea of 'Smurfs' lent itself to the 3-D environment pretty well, I think, better than some of the farm animal movies that have been done before. I was a fan of the 'Smurfs' and they come with their own fan base, which I thought was nice. I'm probably my biggest critic. I worry that if you spend any quality time reveling in good things then karma will slap you upside the head, so I try to stay as even keel as I'm able. I've done plenty of daredeviling - from white-water rafting to bungee jumping. But I think the most fearless was hosting the Emmy Awards. It was overwhelming, and I definitely had to leave fear at the door. 'Smurfs' just seemed like a great way to represent a young father to be, guy in a marriage, work in conflict, and I was really interested in the technical CG side of things. I'd never done a movie that I thought would be so physical and yet so precise. So I was intrigued by all of that. So I've done my fair share of theater. I have also been very fortunate in that I've been able to come to New York two or three times a year just to see as many shows as possible. I think the live theater culture here is incredible. Thankfully, the meat of the Tony telecast is the performances from the shows, so the awards show kind of creates itself around the season, and then I fill in based on the vibe of the season in general. I'm happy that there'll be so many legitimately good performances on the show. The TV schedule is fantastic. It allows you to have a life. Theater actors are so disciplined - especially if you're doing musicals, you have to be in shape physically, mentally, and have to be on your game all the time. That's exhausting. On TV, especially a sitcom, you have a lot of free time to play. The voiceover thing is very selfless. You go in there and they've hired you for your voice, but they know exactly what they want, and the writer's there and he knows exactly how it's supposed to be said. So you can't really argue with them, you just have to let them tell you what to do and then do it. 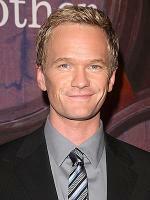 There are so many examples of talented actors working today, no matter how they live their private lives. I'm lucky that people believe me when I'm in character. When I auditioned for the show, I didn't realize it was an MTV production, which is going to make for really good tunes during the episodes, if nothing else. When you call someone and ask them to do something they've never done before, in different mediums I think they would be inclined to pass because they're afraid of the risk. But the creative people who populate the theater world love the challenge of new things. Whether it's a double take or a spit take or an extra-long pause before a reaction or a line, I try to be as cognizant as possible about the technical end of it. So I think the physical stuff works easier for me than maybe for others who are more just going on instinct. I have more artistic control in a smaller show. But it doesn't really matter. 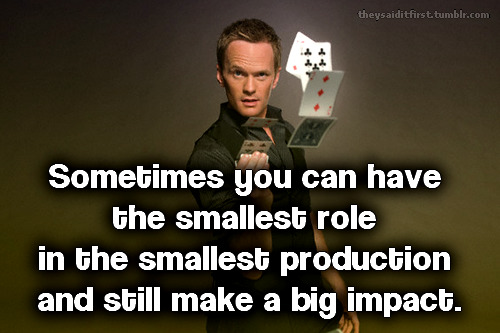 Sometimes you can have the smallest role in the smallest production and still make a big impact. As an actor, you most often play relatively average parts, so to get to play extreme versions of anything, those are the most exciting parts. I do a lot of books on tape for Beverly Cleary, and another 'Smurfs' shout-out for that demographic. I don't know, but I think kids just want to be listened to, so I want to make sure I do that. I don't stay up and rent private jets and go on yachts and whoop it up in Miami. I enjoy being a hyphenate. I've always thought of my career as a plate spinner in the circus. I feel like I know where I'm going. And I like where I'm going. I have a very large forehead. I have a pronounced skull. Maybe producers think that there is a lot going on up in there. I have an unbelievable assistant who handles all of my scheduling! It's like a Tetris game. I like to make decisions based on things I'm interested in doing, not what seems like the next move in my quote-unquote career. I love the 'So You Think You Can Dance' show. I love it. I think it's some of the best hours on TV. I think things through a lot, so I probably use my head more than my heart. 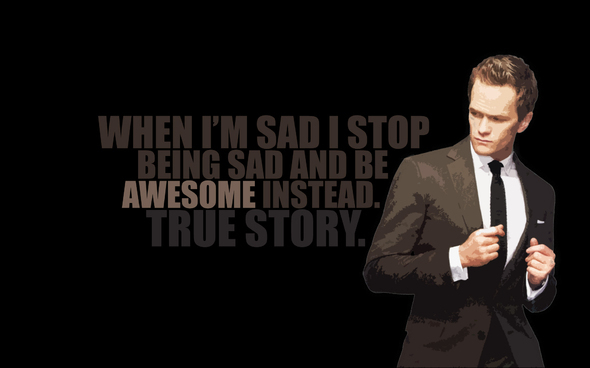 That probably comes through in my acting. I think when dance is mediocre, it's painful. But when dance is really impressive, it destroys. I'm a nerdy, geeky fan of' Labyrinth' and 'Dark Crystal'.